Are you ready to handle more? 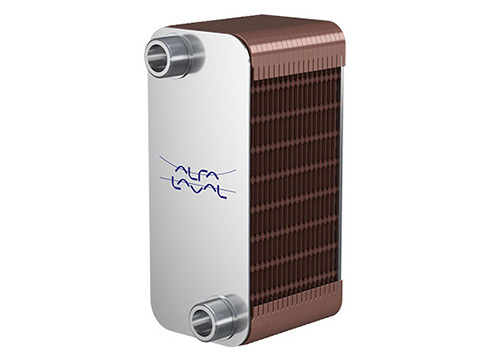 Alfa Laval’s GLX range of brazed gas-to-liquid plate heat exchangers offers a more flexible way to meet the demands of applications with challenging operating conditions. The unique open inlet design of GLX heat exchangers maximizes media flow rates while ensuring the lowest possible pressure drop. Delivered as modules, they can be easily assembled into larger systems to help optimize performance efficiency. Pressure drop is a constant challenge with gas media, and the Alfa Laval has engineered our GLX range of gas-to-liquid heat exchangers with exactly this in mind. The range features a cross-flow arrangement that allows for high flow rates on the gas side, which is designed with completely open inlets and outlets. In addition to limiting pressure drop, this facilitates easy cleaning to help you keep maintenance-related downtime to a minimum. The GLX range is highly suitable for condensation applications. Alfa Laval gas-to-liquid heat exchangers use thin, corrugated stainless steel plates to provide heat transfer from one medium to the other. Copper brazing seals the media in the plate pack, resulting in a high-efficiency heat exchanger that consists solely of surfaces that actively contribute to heat transfer. Contact points between the plates are also brazed, which improves resistance to pressure and temperature fatigue. The arrangement of the channels formed between the plates ensures that media flow through alternate channels in a countercurrent pattern, which further optimizes the efficiency of the heat transfer. One channel is far larger than the other channel, enabling the unit to handle very large volumetric flow rates. Curious about what our GLX product line can bring to your business? Download an overview of our gas-to-liquid portfolio to learn more about how customers use this technology in a number of different applications. You will also find product configuration information as well as technical specifications. 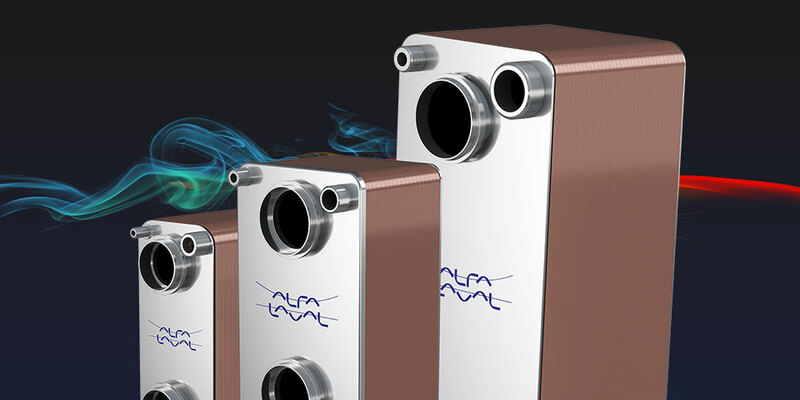 As efficient technology with a very small footprint, Alfa Laval’s GL plate heat exchangers can be used in positions throughout your process. View this example animation to learn more and see for yourself just how compact they truly are! With expertise from decades of experience in heat exchange, Alfa Laval offers knowledgeable resources for today’s heating and cooling challenges. Discover answers to complex questions on everything from energy efficiency to natural refrigerants, along with helpful tools that make it simpler to find the right technology for your application. Do you need the power to handle more in your gas cooling applications? Contact us today to learn more about the complete portfolio of Alfa Laval gas-to-liquid plate heat exchangers. Our experts can work with you to find the optimal model to fit your specific needs. What do you want us to contact you about?